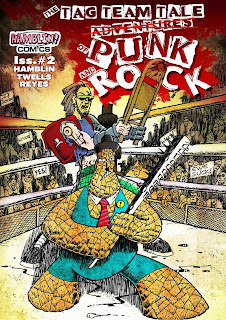 That's right, the team from Hamblin Comics has put together a follow-up issue to the self-published The Adventures of Punk and Rock. 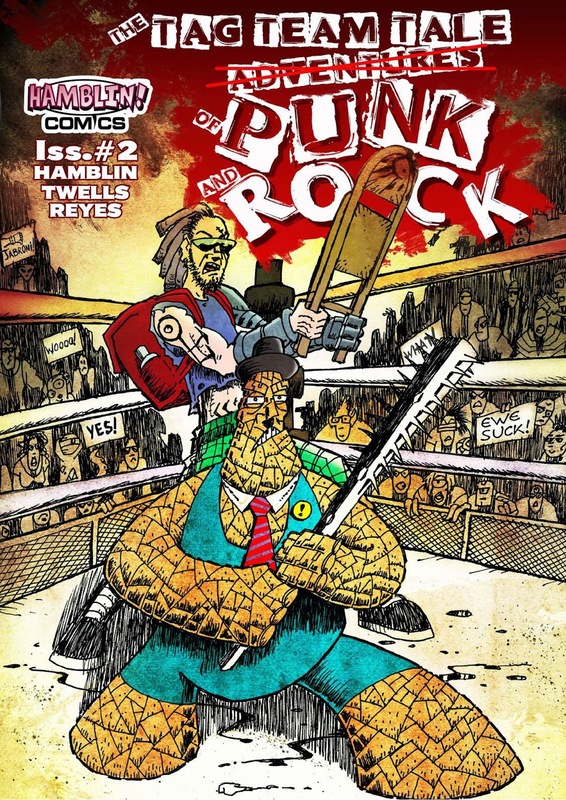 Part Deux, or The Tag Team Tale of Rock and Punk, courtesy of writer Austin Hamblin, artist Scott Twells, and letterer Dario Reyes, brings back the space-ranging team of Punk, Rock, and the narrator Snarky for another round of mischief. The second issue picks up from the last, beginning with the same dynamic of breaking down the fourth wall. The narrator is the part of the main characters, bringing together a triumvirate instead of just of the titular duo. However, in order to inject themselves more into the story (quite literally), the use of this storytelling tool is taken a step further as the creators join in on the antics for a few pages. This is all in good fun and even a little self-deprecating on the creative team's part. Overall, this unique approach is resplendent of the cheeky fun that this comic aims to provide. The audience for this title hasn't changed, though: it's geared toward a mature teen male readership. The story follows a fairly linear style as Punk and Rock set about becoming tag-team wrestling champions. There are some cliché moments and a series of obligatory montage training panels to accompany the quest. 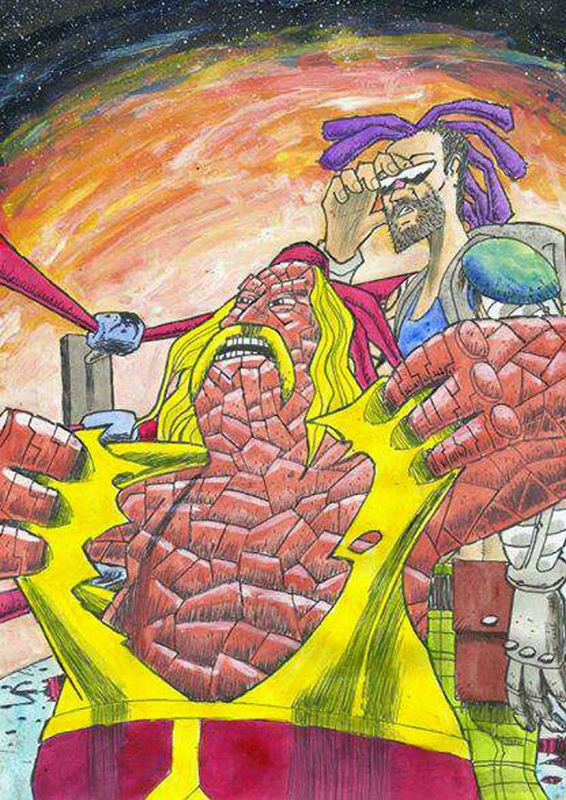 As the heroes start their ascent into the ring, the foolhardiness of their venture quickly becomes apparent. The creators show a passion for wrestling. The art has a rough-hewn, fun aspect to it. It appears to have a sharper edge than the first issue, perhaps wanting to reflect the story content in a balanced manner. The layouts are very reader friendly, making for a quick and easy story to follow. The creators show a passion for their craft that can continue to be refined. There are clear signs of improvement from the first issue last year; however, I am perplexed by the additional story added at the back of the issue. It wasn't clear if that was added as "bonus" content or was somehow linked to the main story. Overall, this comic takes another step forward; make sure you continue to keep an eye out for further work from Hamblin Comics on their website (http://hamblincomics.com/). Check them out and let me know what you think by leaving a comment below or head on over to the Fanboys Anonymous Facebook or Twitter to make your mark, and keep on coming back to Fanboys for more comic reviews and news.